Mary Webster is the Official Wife of the Town Cryer.” OYEZ! OYEZ! John is a 4th generation resident of the Region of York and has a special connection with East Gwillimbury. His parents met in the two room school in Holland Landing. Since he was proclaimed a Town Crier in 1987, he has been very visible throughout the area, conducting historic walks. and reading proclamations at official functions. John performs at over 200 events per year and sits on many boards of community clubs and festivals. 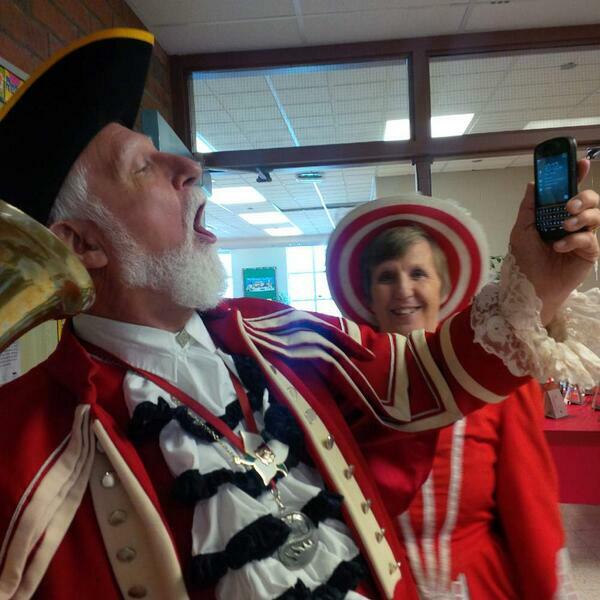 John is also the official Town Crier for Markham's sister city, Cary, North Carolina. John competes in town crier events around the globe. Most recently in July 2017, he won first prize trophy at the Muskoka Escapades of Town Crying competition! Can I share with you how this came about? Join me for a short video where I share some "tongue in cheek" stories as MARKHAM'S OFFICIAL TOWN CRIER! WANT TO KNOW HOW WE CAN ENHANCE YOUR EVENT? Involving an Official Town Crier in your Event Planning will add pageantry and elegance. Here is a sampling of event services I can provide.